Hi Trevor! I read for myself quite a bit using the Celtic Cross spread. What are your thoughts about asking, or thinking, a specific question while shuffling? Is an actual question necessary? and if so how best to frame the question for optimum results? Great question! I think formulating a question as well as some preparation before a reading is very important and can make a tremendous difference in the results we get. 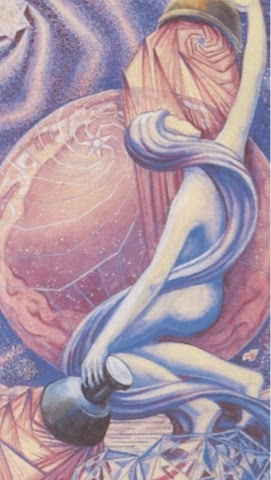 If you follow my blog at all you know I love to improvise in working with Tarot and although there's a part of that which can involve flying by the seat of your pants, we also need to have some structure if we don't want to just be on a wild goose chase. Forming a question or phrasing an intention or need before a reading is an important part of that. 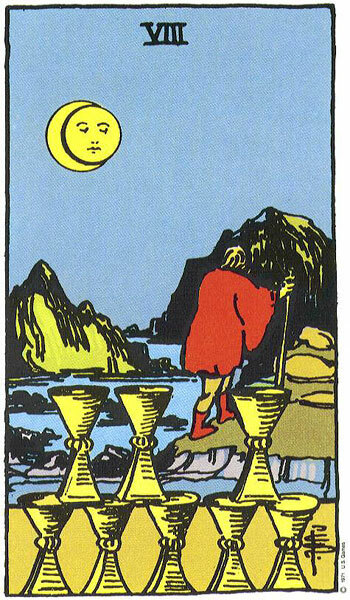 Whether we are getting a reading done, or doing a reading for someone else or for ourselves it's necessary to set some parameters before we begin. There is a great difference between going for a general reading like what I do professionally and a reading around a specific question. I have an approach where I usually ask the person when they come in to relax and shuffle the cards while reflecting on their life, there's usually more than one question and there's usually other people on their minds but even when there is a major issue I don't ask to know this at that point as it would interfere with my objectivity and intuition. I don't try to guess what a person's questions are, rather I see the reflecting around the shuffle as an opportunity for the person to get settled and receptive. I usually cover the person's concerns in the reading without them needing to ask verbally and then I allow time near the end of the reading for other issues or anything needing clarification to be asked. Reading around specific questions though is another kind of approach, I can usually refer back to the same spread for answers and I have my own non-linear variation on the Celtic Cross spread that I use for that (that's a whole other article). But going into a reading with a specific question is more often what goes on when we are reading for ourselves, something I still do, both for study and inner work. 1. Write it down. I've mentioned before the immense value in keeping a Tarot journal. Some people just incorporate their reading into their already existing diaries. Being able to spend a few moments checking into how you are doing before phrasing the question can help us see later elements we may not have immediately thought of as relevant. Don't just write the question, use this as a chance to check in with you. 2. Tailor your layout. Even if you are doing a traditional Celtic Cross layout strictly by the book (now decide which book beforehand - they vary!). I find there is something about determining before hand what the flow of the reading will be. 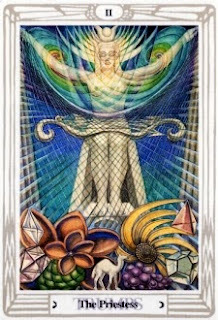 You may decide you want to go with another layout, there's tons out there, just google "Tarot Layouts", and there's plenty of great books - most good "how to" Tarot manuals have at least two or three spreads. Aeclectic Tarot (one of my favorite resources) has tons of info (type in layouts in their search function!) as well as discussion groups etc. around this and many other topics. But decide your layout beforehand. Frankly I find the Celtic Cross a bit stilted for a single query. The main thing is decide and sketch it out beforehand. 3. Focusing and phrasing. Think of what could symbolize this question. Just as in reading for another person we choose what is traditionally called a "significator" you could also choose what I call a "signifier". 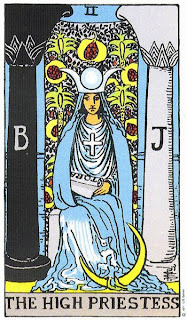 A significator traditionally can be associated with a person's physical appearance, astrological sign or any number of other attributions, it is generally a court card or in some instances where that person might fit with an archetypal role it could be a major arcana card. 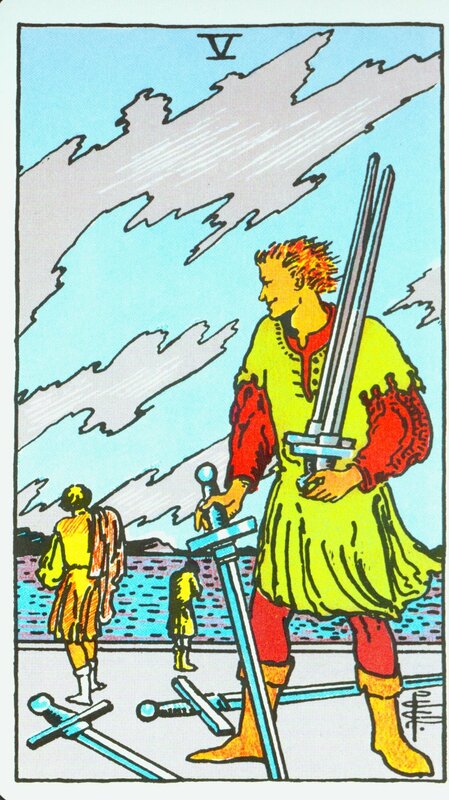 A signifier however is more situational, this is usually a minor arcana card for a mundane situation (i.e. 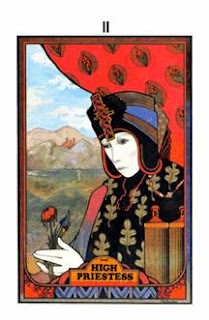 conflict around work could be the 5 of wands, an emotional decision the 2 or 4 of cups). 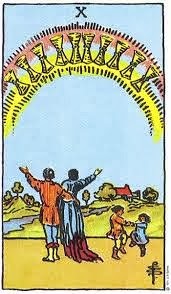 Or a major arcana card around a life lesson or something more internal. 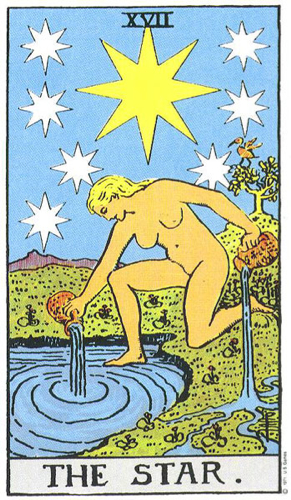 Also Aces make great signifiers, you can use an Ace to be a focal point for a particular area of your life or the part of your consciousness it corresponds with. Here's a neat suggestion too; go through the deck and visually recognize cards (that's right more than one) that could help you phrase your question. 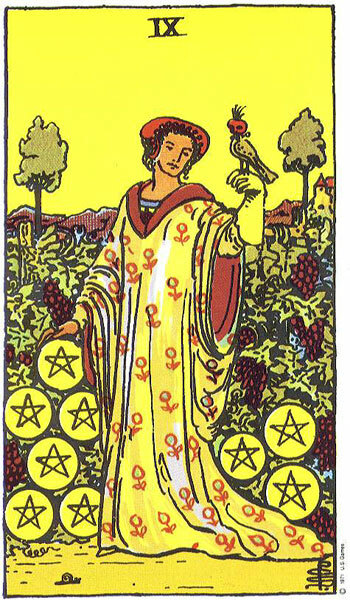 For example: Aunt Harriet (the Queen of Wands) is needing a lot of medical assistance (maybe the 4 of swords) and has worries around property and some dependant people (5 of pentacles). We could write those cards down with our question, take them out and look at them while shuffling and then shuffle them back into the deck. It could be that some of these cards actually come up in the reading! 4. I'll throw in this groovy little suggestion too: an alternate approach is to set aside a particular card (only one in this instance) go through the shuffle while looking at it, then when you have gone through the overall procedure (shuffle and cut) set aside the number of cards from the layout (10 for the Celtic cross for instance) and then (as you would traditionally with a significator) you could lay that first card of the spread down on top of that OR (and this is fun) shuffle the significator/signifier into the pile of cards (in this case 10) that are to be used. 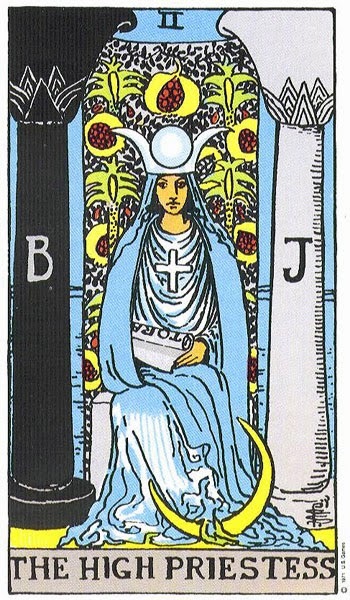 Where that comes up is where things are in relation to the question so if the signifier comes up as the third card you still lay a third card on it but it is telling you your question is particularly relevant to position three. This is meant to be an example of how we can further design or set up structures for insight. Have fun with it, be creative and enjoy! I've formulated a lot of spreads this way. Hope this helps, thanks again for the question and by all means to everyone out there, post back and let me know of your results! In response to a recent question about working with instinct and intuition, here is a little Youtube video. Working with instinct and intuition in doing readings requires not just perception of others but also self honesty - the ability to know what parts of ourselves are present in perception, and being able to park our own baggage to be constructive and open. I love sharing around these topics and value questions and suggestions for further articles and videos. My schedule is busy but with a fair bit of flexibility in the next few weeks. If you are planning on being in the Winnipeg area and would like to book a reading with me give me a call at (204) 504-9575 to set something up. Sorry I am not doing phone or internet readings at this time but there is some interesting growth and evolution in the works, any changes in the structure of my work will always be announced here. 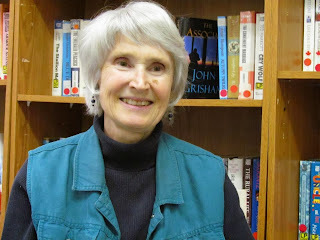 Many readers have various forms of experience, maybe reading privately or through structured or independent study. This is all to be respected but it's also fair to ask what sort of experience that is as reading as an interest and reading professionally can be very different. One is not necessarily better than the other. I know some great readers with very little professional experience and the professionals all had to start somewhere! Feb. 1982 to June 1986 -The Chocolate Shop restaurant. I initially worked for descendants of the same family that had this place going back to 1918. Madam Red (Winnipeg's most famous reader) and many other fascinating readers, people and characters had their start there. It was a location famous for readings and still remembered fondly by many Winnipeg people. The first 3 years there were a joy, I had to begin as a fledgling and work my way up (and did) but the last year (1986) was under a new ownership and frankly just wasn't the same. You can buy the name of a business but you cant buy it's experience or spirit. it changed hands a few times since then, went through highs and lows and at times had some other good readers but is now long gone. 1986 to 1995 - The Eastside Exchange Bar and Grill 177 Lombard (behind the Richardson Building), this was an upscale establishment and I was the main full time reader there from when it initially opened and on for 9 years. This truly gave me the opportunity to develop my approach, establish a uniquely diverse client base and I had the privilege of working with some fine people and fellow readers that I have many fond memories of. However my clients had been asking for some time for a more private appointment based structure so it was after 9 years, time to evolve and change. 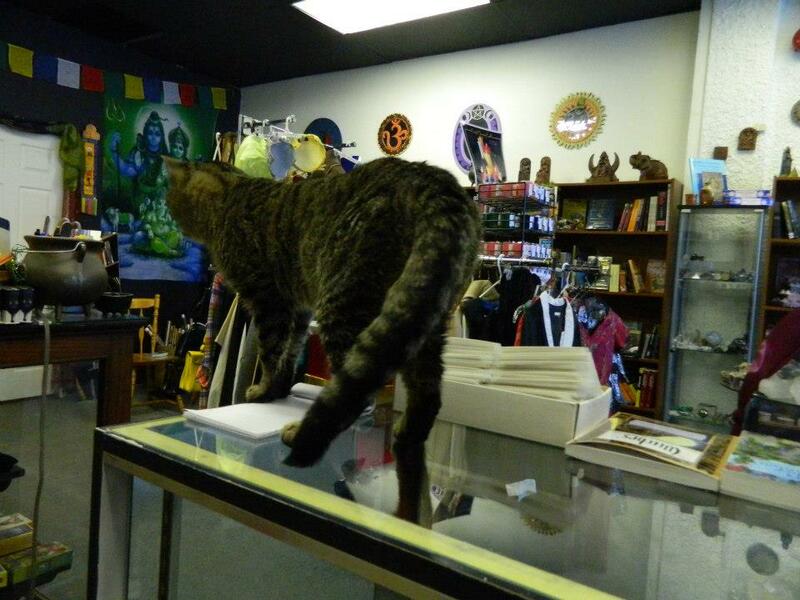 1995 to 2012 I worked independently through co-operative shared space at Blackletter Books in a private reading room. The 17 years I spent in this North End location were very rewarding. 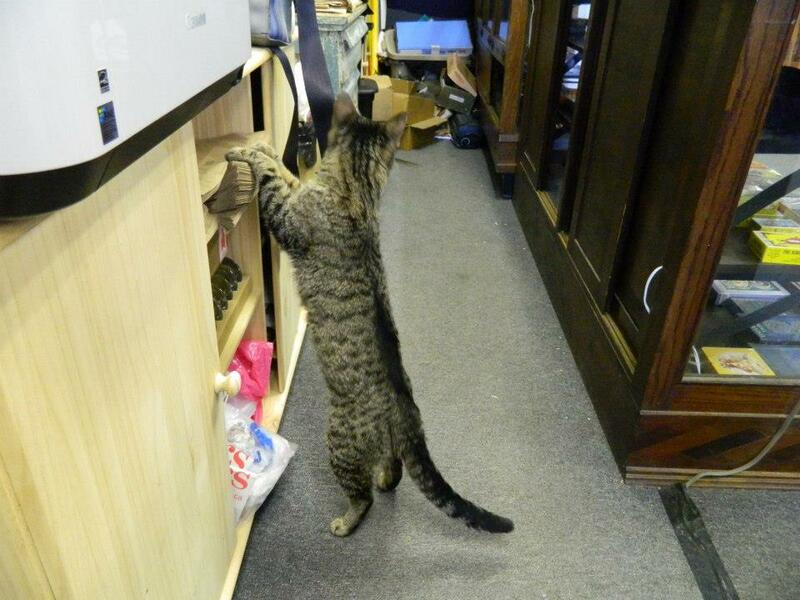 Working with Jan (the bookstore owner) was also a great experience, I am grateful for his support and the time there. June 2012 to March 2015 I have continued my independent work through co-operative shared space at Elemental Book and Curiosity Shop in the vibrantly growing West End. I enjoyed working alongside another business and Dominique is a good friend. I appreciate her support and so much of her business and work is an opportunity for me to further learn and share. 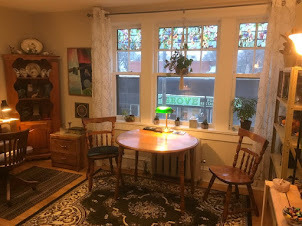 March 2015 to present, I am delighted to now be working by appointment through my own "Reading Studio" at 216-165 Stafford St. at Grosvenor Check out "Contact/Appointments" to book a reading. In all this time I haven't taken much time off and although I have had some other side jobs along the way, reading is still my chief work, my passion and my joy. I've seen a lot come and go through all this time. The industry changes, ebbs and flows. I'm looking forward to further adventures, further learning and sharing. Stay tuned for further evolution! "I've said it before and will say it again, acceptance is greatly overrated and not really a virtue (in itself), especially when you consider the alternative is denial. Appreciation and recognition are the greater things, seeing the innate worth in people or situations especially when they are difficult. Accepting difficult circumstances is important - like knowing when you get rained on...you get wet. Accepting is not about approving or liking what's going on. We have to begin with acceptance but it is only a beginning. "I accept this" is you saying you'll cooperate with reality. Saying "others feel this too" and "what can I learn from this" is where we start finding treasures. That's the start of the real adventure." 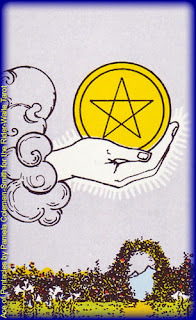 - In Tarot it is the suit of Pentacles that relates to ownership, owning up and seeing worth and value in ourselves, others and situations. I've used the Ace of Pentacles to illustrate this piece. A: Hi, I'm asked this sort of question often so I'm including somethings in my answer beyond what you have asked. I often have couples come in together and you are always welcome to bring along a supportive friend. The session is for the person being read but the reading should pick up on the dynamics of a relationship and I will discuss to a degree the things a partner may have going on insofar as how they relate you, but it's not a "two for one" dynamic. In terms of both people seeking direction and having individual issues, it's best to book two consecutive sessions side by side. 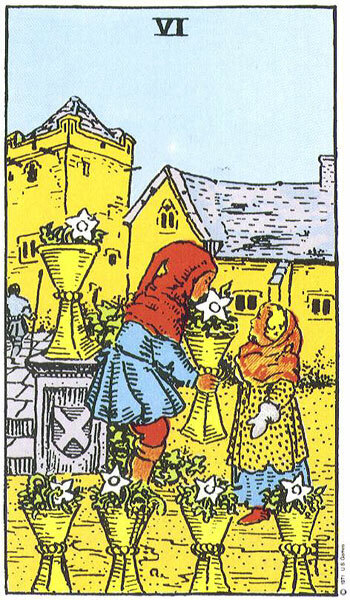 Again it's important for those present to be open minded and comfortable with what's going on, it's never a good idea to surprise someone with a reading, I won't impose what I do on someone unwilling or uncomfortable. I should respectfully mention too that other readers work in many different ways and some offer different promotional rates (often when they are beginning to establish their client base). Being fairly well established (after 31 years) I generally only offer promo stuff when I am reading for charity or a worthwhile cause. Most of the readers I know in Winnipeg charge rates far below what you'll find in other cities. I also sometimes reserve the right to wave a fee or make exceptions when the situation warrants. By all means these things can be discussed when you call to book. I look forward to being of service and thanks for your interest! "February made me shiver......with every paper I'd deliver, bad news on the doorstep, I couldn't take one more step". That's a great line from Don McLean's iconic song Bye Bye Miss American Pie. Many people know the song, it's sentiment and feeling goes beyond those who know the original reference is to the death of Buddy Holly, the end of the idealistic 50's, the disillusion, protest and new vision of the 60's and a kind of maturation that many like the singer came into reflectively in the 1970's. We don't have to know these things to get the feel or essence of them through the song and, interpretations aside, something in it resonates with anyone who has experienced disillusion, has nostalgia for a simpler time and looks back with a feeling of our impermanence. Madonna covered the tune more recently and a much younger audience probably has their own associations they can make to it. It (the song) came to mind today because February in Winnipeg literally DOES make me shiver. It's been unusually cold this winter, sometimes a wind chill of -41 Celsius. It tends to make us all stay in, be reflective and both nostalgic and hopeful for warmer times. This particular winter has been hard for a lot of people, a number of longstanding businesses in Winnipeg have transitioned and closed, the Paddle wheel Restaurant in the soon to be closing Hudson's Bay Store, Kelekis Restaurant in the North End and soon (on February 28th) my previous location at Blackletter Books (see the article previous to this one "Cycles Of Change"), along with a great many other places that many of us have held dear. It's sad to see these things go, but the world is changing right before our eyes. At the same time, living and working in the West End has been a time of growth for me personally. The close proximity of the University Of Winnipeg means a lot of young people from all over the world as well as the various instructors and people who are resources around that. There's a lot of growth going on, from the new learning and arts related centres to some new small businesses and restaurants. In many ways Sherbrook Street, for instance, reminds me of Osborne in the early 70's when a number of fledgling businesses and restaurants started up. It's good to see next generations of young people creating places that reflect a sense of community as well as some great surviving stand by places that support and mentor on other levels. In line with that mentoring, we also have a lot of Seniors housing nearby. My mother is presently residing in one of these and I'm able to be just steps away from her if she needs me. 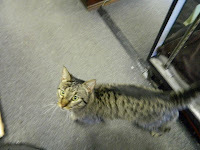 She is experiencing a lot in terms of age related issues and it's easier to be near, this was a big factor in the changes I had to make. I appreciate her being in a place that's safe, affordable and warm in terms of community. It's heartening to see the kind of support that's come together around this little fellow and I'm very grateful to all who have helped out. As I've said before, these aren't easy times, but these are also times where we all can reach out and be there for one another. A lot of creative, meaningful and useful things are born out of these conditions. 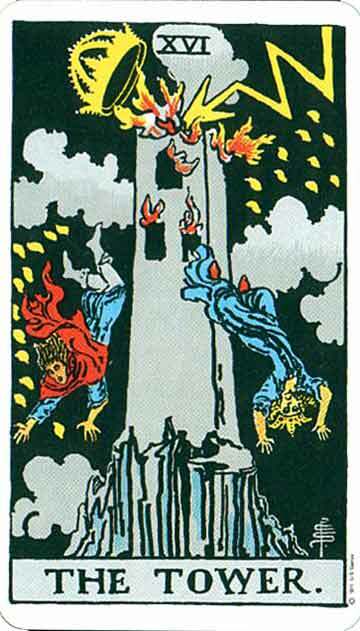 In Tarot symbolism The Tower is the shake-up of our structures, sometimes upheaval and trauma, but also a breakthrough where our old ideas of belief, immunity and security get severely tested. When we go through these big bumps we can run around looking for new structures, new systems to keep us safe and immune, we can panic like chicken little sharing our hysteria, or we can let go. Letting go doesn't mean giving up, but we count our fingers, count our toes and see that we are whole, that even in uncertainty we are OK.
We also see, when we are willing, that others are and have been moving through this too and this wakes up our compassion. In my own life it was hard to leave familiar ground recently and being close for a loved one who is aging, losing some of their Independence and ability is a challenge and not all sweetness and light. Yet at the same time, what kind of life is there when we don't have concerns, things to care about or be there for? Pretty shallow and empty. In terms of my mom's issues I am blessed to have family that shares concern and it seems like a lot of my friends are working with similar issues. I've found this again and again, when we stop resisting what's going on, when we stop saying "this shouldn't happen to me", we start to see a way through. What's more we develop understanding and the intimacy of not running away, showing up, doing what we can do and often being surprised at that. A resource I have found very helpful through this last while is one of those books that I read a little at a time, digesting the words and going back to them again. 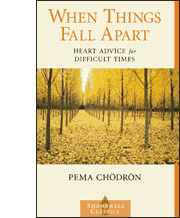 Pema Chodrun's "When things Fall Apart", gives a lot of insight about moving through uncertainty, using it as an opportunity to open up, to stay present and have compassion for ourselves and others. I recommend it highly. 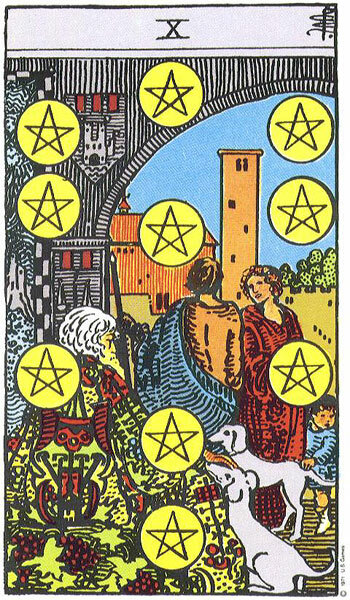 It's also good to remember that the Tower is followed in the Major Arcana of the Tarot, by the Star. When we let go of belief structures that do our thinking for us, we begin to get glimpses of our greater self, our real potential. Our direction , like following a pole star, isn't based so much on circumstances but on a sense of something greater. Our security isn't much if it's based on what we can lose, if we are worrying over it, it's owning us. Change, difficult as it is, can be our friend. It can free us up and show us what has been owning us. Our creativity and ingenuity can overcome tough times. They say "necessity is the mother of invention" and tough times help us see what really is necessary.